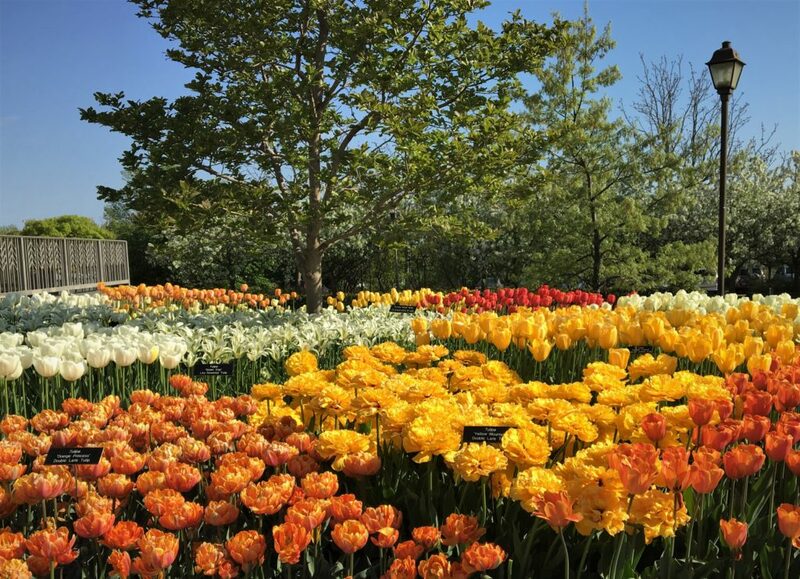 Fellow garden lover Curtis Siller recently traveled to Minneapolis and while there visited Minnesota Landscape Arboretum and he offers this visit. 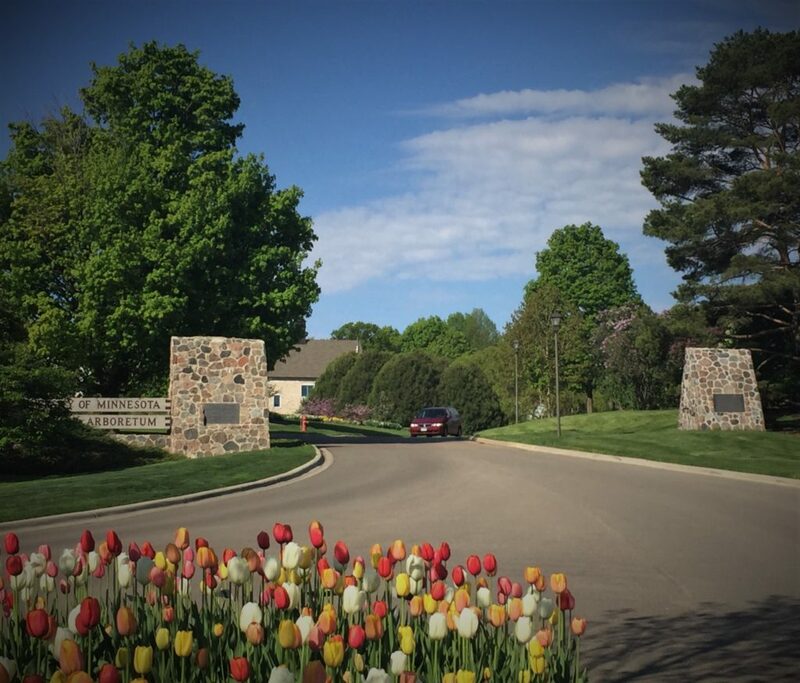 The Minnesota Landscape Arboretum (MLA), in Chaska, recently won top spot in the “Best Botanical Garden in the United States” contest by USA Today. MLA covers more than 1,200 acres of gardens, woods and prairies, showcasing over 5,000 plant species. It displays flowering shrubs, trees and plants, interspersed with sculpture, places for meditation and reflection, and special exhibitions. An adjoining building contains a horticultural library and conservatory. Visitors are presented with numerous botanical choices: formal gardens; plant collections; environmental models; a landscape of woodlands, wetlands and prairie. To help structure a visit, a “Three Mile Drive” includes a dozen points of interest, with many beautiful vistas. There are enough points to fill a day: Several pictures depict points of interest and stops along the way. 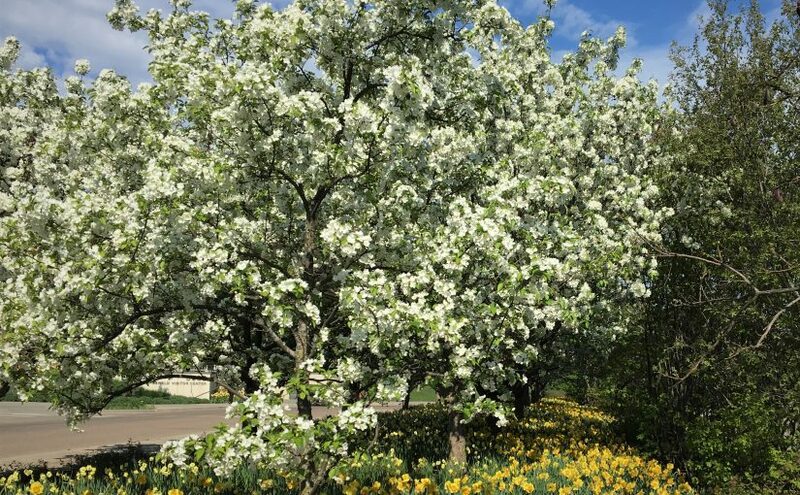 MLA plantings reflect Minnesota seasons. 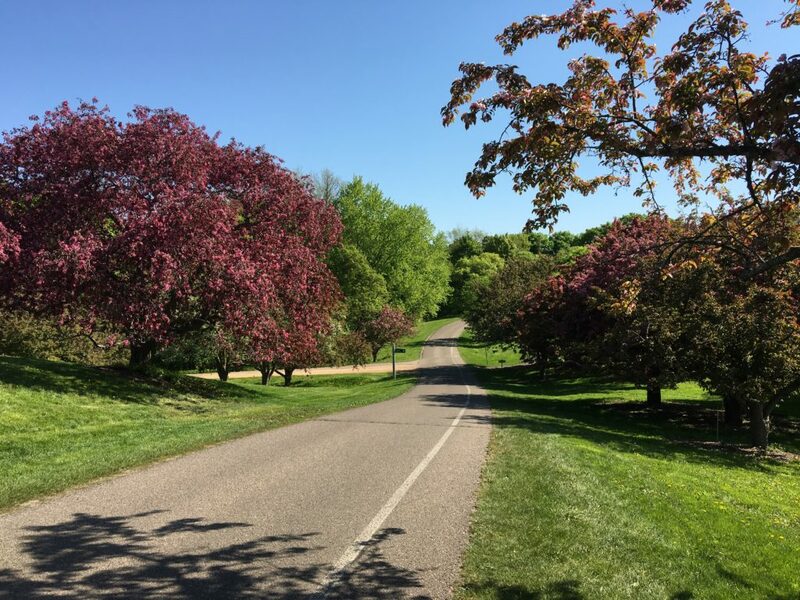 The Arboretum fills two needs: beautiful displays and insights as to what works well for planting in the Minneapolis locale. During my visit, tulips graced the formal areas near the entrance, while some shrubs and trees were coming out of winter dormancy. For the inquisitive visitor, there is much to relish: nine miles of cross-country ski trails, nine miles of snowshoe trails, and 12 miles of hiking trails. A special exhibit was on display while I visited. 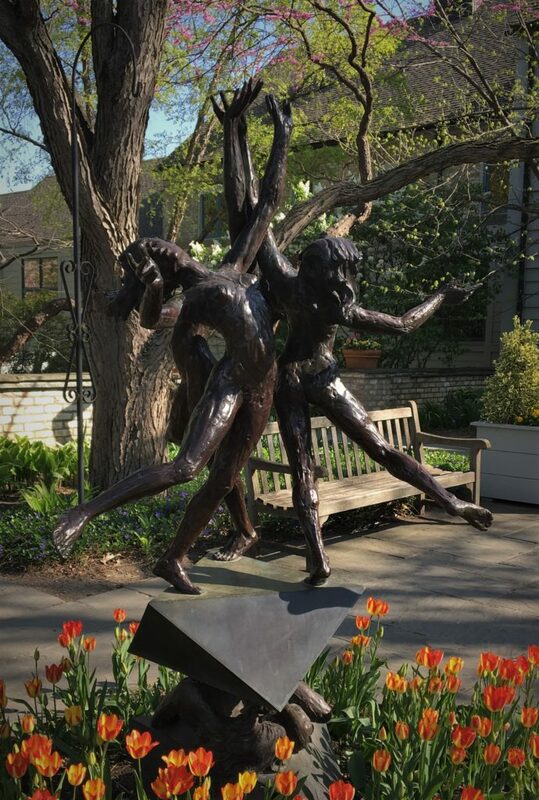 Typical of world-class gardens, artisans showcase their work and later travel to other prominent gardens in the USA. 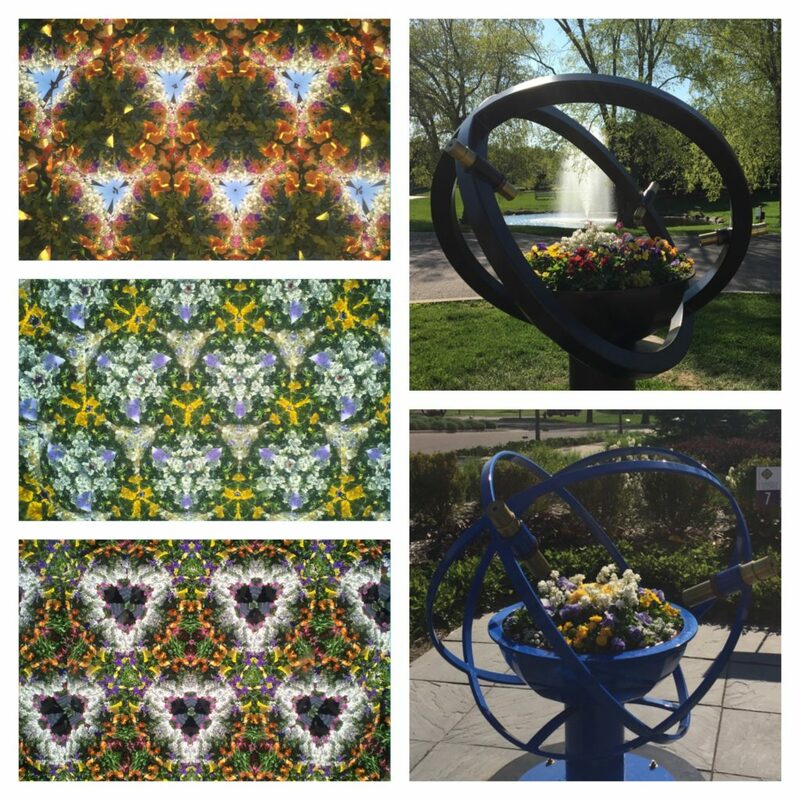 Of special interest were floral kaleidoscopes crafted by a local artist, Robert Anderson. (His work has been displayed across the United States, Canada, and Japan.) The accompanying photo shows two of 15 kaleidoscopes displayed during my visit. The kaleidoscopes are comprised of a colorful, rotating arrangement of seasonal flowers with several scopes affixed to an external frame. The accompanying picture illustrates what the assemblage looks like, accompanied by representative views when peering inside. This particular artisan exhibit is available through September 2017. Whatever time of year you visit, you’ll find the Minnesota Landscape Arboretum a delightful experience. To learn more, go to www.arboretum.umn.edu. Photographs by Curtis Siller and Deborah Siller Houston. Expository comments contained in this contribution were extracted from promotional material available at the Arboretum. Absolutely beautiful! Stunning photography with clear descriptions. Thank you, Norm, for your very nice comment!